So this past week was pretty fantastic. Last week during our weekly planning session it kind of just came to Elder Agabu and I were not going to be together for much longer, which was really very sad. I love him alot and i will miss him like crazy. He has been one of my favourite companions ever, just because of his hard working attitude. We were able to find many new investigators together and did our very best to continue to bring people to church. He opened my eyes to alot of the aspects of the work and i am grateful we had the opportunity to be together. But this was in fact my last week in Thaba ‘Nchu which i did my best not to get to sad over. I love this area really with all my heart and all of the members and investigators who we met as well. It truly is a great place to be a missionary in. One of the members who i have gotten to know so well made me a birthday cake which truly was delicious haha. And i didnt get a letter for my birthday. All i got was best birthday wishes, a cake and another pie from the seniour couples which again was delicious haha. 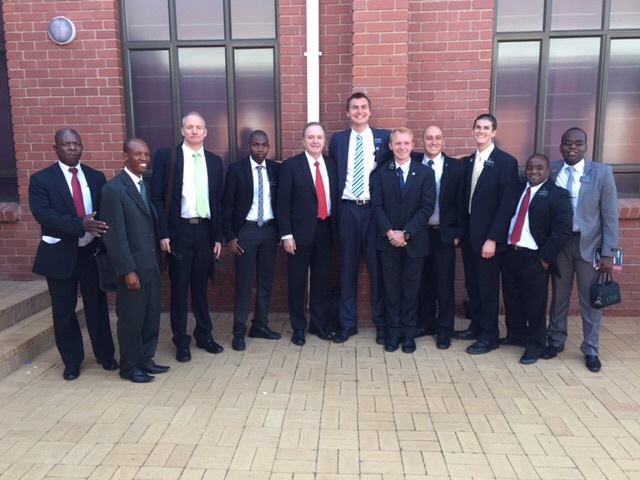 On saturday we traveled to bloemfontein for stake conference, that was presided over by Elder Lynn G. Robbins of the presidency of the seventy and was also accompanied by Elder Hall of the third quorum of the seventy who actually comes from Johannesburg! But the stake conference session on saturday and sunday was awesome. He told us to think about ways we can continue to keep the sabbath day holy, when dealing with people how to be more Christ like in our actions and also the power of fasting. It made me think about how i can be better as a missionary and after mission as an individual. He also spoke of the mantle of authority which President Monson holds and a few of his many experiences with members of the twelve. Another experience he gave that i really liked was when President Packer called him to his office. When he walked in he was told a few things by president Packer. And i quote “Now so you know i am going to reprove you and help you by correcting you. But if you dont like it I wont do it ever again. Do you want me to sugar coat it or should i give it to you straight?” It gave me an example of what we need to do in our lives when someone needs correction. He later told us that this was how Heavenly Father would act as well. He wants to help us, but he wont nag on us. How willingly would you repent if the Lord told you every day of all the things you have done wrong? You would get very tired of it. And he said even though it will be tough, leave a lot of matters to the Lord when you need to give someone correction and it will com out alright. Well just so you know as well im getting transferred to an area called Kwamashu that is very close to Durban which is exciting. Have a good week family!! I love you and wish the best for you!! 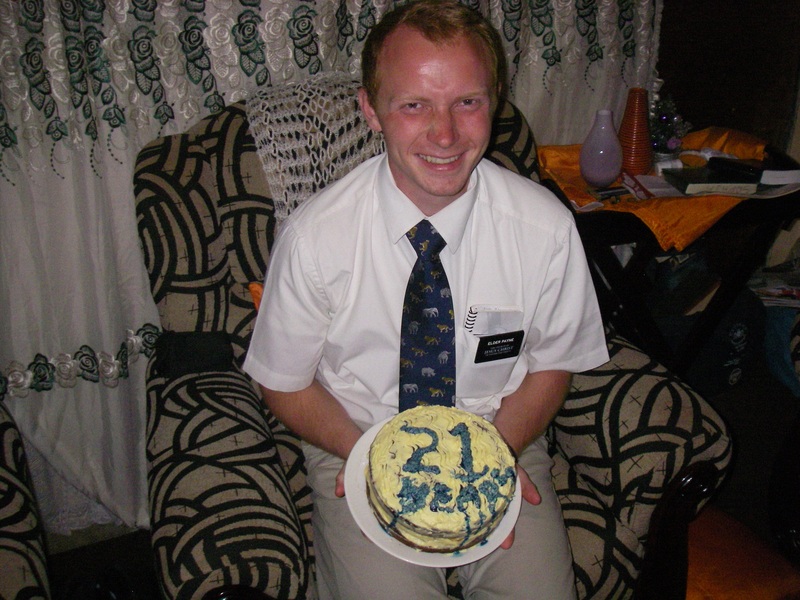 Elder Payne with his birthday cake some kind person made him! Previous PostFamilies with Divine PotentialNext PostNew Area and Companion!